Dark matter is an aspect of the universe we still don’t fully understand. We have lots of evidence pointing to its existence (as I outlined in a series of posts a while back), and the best evidence we have points toward a specific type of matter known as cold dark matter (CDM). One big downside is that we have yet to find any direct detection of dark matter particles. In fact, many of the likely candidates for dark matter have been all but eliminated. Another is that cold dark matter doesn’t agree with our observations of dwarf galaxies. Now a new paper presents a solution to the second problem that might even help with the first. The main problem with dwarf galaxies is that there are fewer of them around spiral galaxies than dark matter predicts. When we do dark matter computer simulations, the results always have more dwarf galaxies than we observe. This has been taken to mean that either the simulations are somehow flawed, or dark matter isn’t the complete solution we’ve thought. This new work looks at a modified version of dark matter, and how it effects these kinds of computer simulations. Normally, it is assumed that dark matter doesn’t interact with light directly at all. This means we can see its gravitational effects, but we don’t see anything such as absorption lines and the like, which we observe with regular matter. The reason for this is that dark matter makes up the majority of matter in the universe. About 90% of the mass in our own Milky Way consists of dark matter. If it interacted much with light, then we would have seen its effects on light by now. This new work proposes that dark matter does interact with light, but only very, very slightly. Now you might think that if dark matter interacts so slightly with light that we don’t see its effect, then it certainly can’t differ that much from standard dark matter, but the team showed that this very small effect can build up over time, so that modern galaxies have fewer dwarf satellites, just as we observe. You can see this in the image above. The top left image is standard dark matter model, with too many satellite dwarf galaxies. The top right is a warm dark matter model that solves the dwarf galaxy problem but doesn’t agree with other observations. 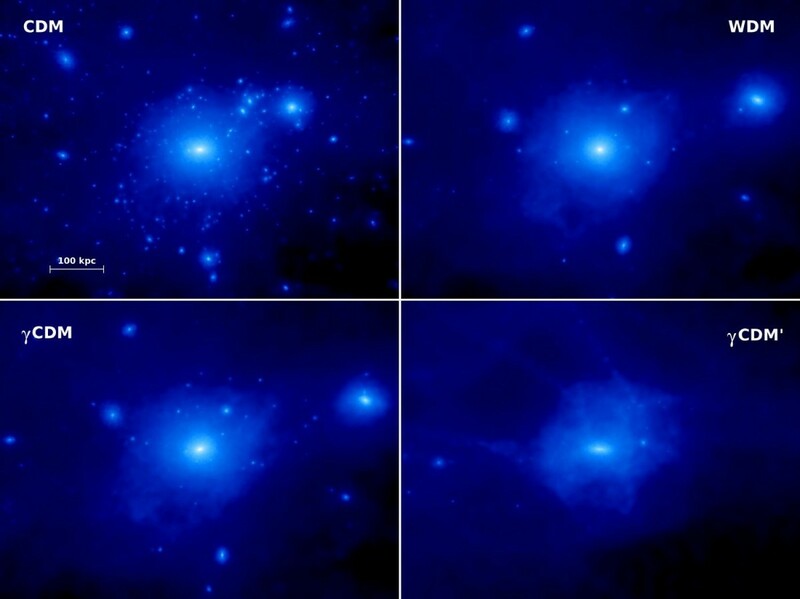 The bottom left is this new, light interacting dark matter model, and the bottom right is what happens when you make the light interaction too strong and get no dwarf galaxies. So by modifying dark matter to include slight interactions with light, the predictions match dwarf galaxy observations. It should be noted that just because this modification works, that doesn’t mean it is the solution. Tweak theories are weak theories, as I’ve said before. This type of dark matter could also affect other things such as large scale structure, and this would need to be studied before we could be confident about this particular model. But the work does show that dark matter models can address some of the known problems with dark matter. Paper: C. Bœhm, et al. Using the Milky Way satellites to study interactions between cold dark matter and radiation. MNRAS 445 (1): L31-L35 (2014). Out of interest, what would the cross section for em interaction be? I’m glad you wrote the last paragraph and I appreciate the honesty. Without that paragraph you could have been called out easily referencing recent post of yours. So I’m glad that you are as critical towards work which favors your opinion as to work which doesn’t. Opinion is a bad word in this context though.